We are growing our sales team! We are looking for experienced and professional sales representatives to introduce customers to the boating lifestyle, generate sales leads and listings and grow existing sales databases. You must be entrepreneurial, motivated, adept at learning and retaining product knowledge and skilled at developing sales and marketing strategies and achieving targets to grow your respective portfolios. Sales is the core function of the company with a reach that extends through Western Canada, Washington and Oregon States.  Specialty Yachts is one of Western Canada’s oldest recreational marine companies, representing local and international quality power and sail brands. If you love sales, enjoy being on the water and believe in the value of building long-term relationships, we want to hear from you. Greet customers to sales office and show boats on Specialty’s docks or other marinas. Communicate daily with current, past and prospective customers by email and telephone. Work collectively with other members of sales team to facilitate listing, sales and closing requirements, including contract development, product quotations, payment collection, sea trials and commissioning. Collaborate with sales, service and administrative team members to organize company requirements, such as marketing communications and events. Prepare for and participate in up to six boat shows a year in BC and Washington State. Manage and grow respective CRM database. 3+ years in marine industry/consumer luxury product sales. Comfortable handling individual sales in the $150,000 – $2,000,000 range. A self-starter who is driven to close sales. Earnings dependent on experience, focus and commitment to growing portfolio. Financial support for training that supports agreed personal development plan. Brand new office in the heart of BC’s marine community — Granville Island. Please forward cover letter with your resume to info@specialty-yachts.com. We thank all applicants in advance. Only candidates selected for an interview will be contacted. Repairs, commissioning, maintenance, upgrades and installations on new and pre-owned yachts at busy Granville Island dealership and brokerage. How many years of Marine Service experience do you have? Do you have the following license or certification: MST or ABYC equivalent? We thank all applicants in advance. Only candidates selected for an interview will be contacted. We are always keen to hear from those interested in sales, service or administrative careers in the marine industry. Please forward your resume and cover letter to info@specialty-yachts.com.